He commends the IPCC AR5 report as being "as good as science can do". He says the difficulties of communicating the uncertainties in climate science are far greater than for other science communication problems that he has been involved in professionally, such as smoking and cancer. He goes as far to say that, in this regard, climate science will be a model for other sciences. That's high praise indeed from one of the world's expert science communicators. We, all of us, have areas of "devastating ignorance" that need to be filled in with facts and new perspectives. Listening to a Hans Rosling is always entertaining, but it can also be rather unsettling. Thomas Stocker's talk on the IPCC AR5 WGI Summary for Policymakers report followed Rosling's talk and is also well worth watching. "We think we have done more than we have done and we haven't understood how much we have to do. " That's the take away. I am glad that he is at least acknowledging now that there is a price to be paid for raising the affluence of countries to the point where they undergo a demographic transition and stop growing in population. I would hope that he would include the point that coal is not necessary for lifting people out of poverty any more. In many cases, solar and especially wind are better values. Infant mortality before industrialization had as much to do with ignorance about sanitation as about the rise in incomes of families. We can still keep babies alive (and provide the parents with contraceptives) without relying heavily on coal. Thanks for posting this, I hadn't seen this yet, and any video by Hans Rosling is worth watching. My Favourite definitely has to be the Magic Washing Machine. "Less than 1% of the world's energy is currently generated by wind and solar power. In a survey of the UK public, 70% of people believe that the amount is five times or more that"
I'm not suprised by that at all. Here's another fact - In 2012 non-hydro renewables supplied about 8.3% of Germany's energy (BP 2013 Statistical Review of World Energy). Take away the various bio technologies and solar+wind supplied perhaps 5% of Germany's energy. So what has been achieved in the nation that has probably spent the most money on solar and wind is right at the bottom of UK public perception of what has been achieved globally. Which should lead to the obvious question of what are the sources of this vast disconnect between public perception and reality. You really don't have to look too far for a couple of major contributors - various "green" organizations and the PR machine of the renewables industry. The public is bombarded with stories about PV in Germany generating as much power as "N" nuclear power plants (yes for an hour or two, but what about the rest of the time?) or PV supplying 50% of electricity (same story). If you want to find out how much energy was produced by PV in the middle of winter, you have to ferret out the information yourself - it won't be headlined in the Guardian. There has been a sustained campaign to overstate the achievement of solar and PV. Making the situation worse is the terrible energy reporting in the media. Frequently mixing up MW and MWh, pretending that there is no such thing as capacity factor, and singing the praises of some project or other on the basis that it will power "X" homes. Since when is a "home" a unit of energy or power? The "X" homes stuff is especially deceptive because it carries that implication that powering all homes by adding "n" more such projects will deal with the problem. No it won't - not even close. You don't have to wonder too much about the motivations of the renewables industry in this ongoing charade, but how about the "green" organizations? Why have they deliberately done their best to create such a disconnect between reality and public perception? The answer is pretty easy - they fear that perception of the achievements of solar/wind that matches the reality will open the door to nuclear power. And they do not want that - not at any price including the price of fundamentally obsfuscating the climate/energy problem. Wind power accounted for about 4% of US electrical supply (Table ES1.B) in 2012, and accounted for 25% of electrical power in the state of Iowa. Miles to go, certainly, but significant contributions from renewables are possible. quokka - You might consider the details of the Comments Policy, in particular regarding "No accusations of deception". Those are serious accusations in your post, and without any support. quokka: you are correct about the solar and wind contribution to German energy supply. According to this spreadsheet it amounts to about 4.5%. That is sobering when you consider what a vigorous (and inspiring) effort the Germans have made to promote renewables and how much progress there is yet to be made before the economy is decarbonized. The more I look at the problem of decarbonization, the more I believe that any solution will require an "all of the above" approach, with nuclear, CCS, conservation, lifestyle changes along and so on, along with solar and wind power. OK, my comment was mildly inflamatory, but somebody has to ask the question - how did the public become so badly misinformed about the contribution from wind+solar? This subject is deserving of more than a little attention. This level of "devasting ignorance" falsely and quite directly implies belief in a level of success in dealing with the climate problem that simply does not exist in reality. Collectively we are failing despite whatever local or national efforts have yielded some measure of success. The emissions intensity of the energy sector worldwide has not improved in 20 years (source IEA) but energy consumption has risen sharply and will continue to do so. I see little to be gained by not being ruthlessly honest about this. Complacency is not helpful at all especially among those members of the public who do accept the science and believe we have a serious problem. Just as an aside, the only period in the last 50 years when the emissions intensity of the energy sector did improve was between around mid 70s and early 90s due to rollout of nuclear power. Anything other than "all of the above" looks increasingly untenable. [JH] Unsubstantiated global assertions (e.g. "...how did the public become so badly misinformed about the contribution from wind+solar?") constitute sloganeering -- which is prohibited by the SkS Comment Policy. Please read and adhere to the Comment Policy. the more I believe that any solution will require an "all of the above"
Surely, we've known this for some time: 15 "wedges"
I'm not sure who the "we" is. For example there is not a single "environmental NGO" in Australia that does not oppose nuclear power. I'd be delighted to be proved wrong, but I don't think I will be. Not only do we need "all of the above" carbon-free energy technologies, but we also need everyone who cares about climate change--and there are all too few of us--to work together and not break into factions over who has doubts or preferences about a given energy solution. I'm not sure who the "we" is. I meant the readers of Skeptical Science. The article I linked to is dated 2010. There are some prominent environmentalists that are "pro" nuclear power: George Monbiot is one. And there is a spectrum of views within a pro Nuclear viewpoint from enthusiatic endorsement to its grudging acceptance as a temporary fix. Actually, I doubt that 'all of the above' is going to be the eventual solution. Even if we ignore nuclear's massive perception problem, it is now the most expensive of the major power generation methods. Coal, natural gas, petroleum, hydro, wind, and solar are all cheaper than nuclear. Global nuclear power hit a plateau after Chernobyl. Fukushima killed efforts at a revival. It seems inevitable that the falling cost of alternatives will now lead to declining nuclear power. Nuclear can't compete against cheaper, cleaner, less controversial alternatives. The only thing it has going for it at this point is steady output... but distributed generation, improved power grids, and energy storage are already starting to erase the supposed 'intermittency problem' of wind and solar. Nuclear could have been a viable path, but its time has passed. In 50 years most electricity will be generated by wind, solar, and/or some 'new' technology which isn't currently viable. BTW, Rosling's statistic seems out of date. In 2010 wind was 2.5% of global electricity generation and solar 0.14%. Those figures are now roughly 3.35% for wind and 0.55% for solar. Even if he was referring to total energy consumption (e.g. transportation fuel, burning wood for heat, et cetera), rather than electricity generation, Wind+Solar have still been over 1% for several years now. CBD: some references for those figures would be useful. Rosling was referring to energy not electricity generation. I think that a stronger criticism of his numbers would be that he neglected the role of solar water heating, especially in China, which would probably put the percentage of solar and wind comfortably over 1%. I am guessing that he was referring to wind plus solar electricity generation (PV and concentrated solar thermal) when he talked about solar+wind and did not include solar hot water. 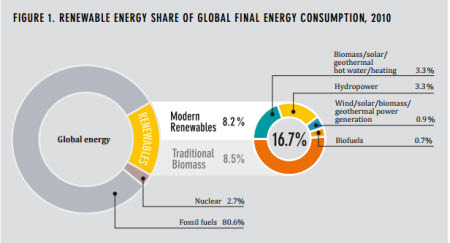 The figure below comes from the document Renewables 2012 Global Status Report. It is for 2010, but shows less than 1% of final global energy consumption coming from wind, solar, geothermal and biomass electricity generation. There are also problems in accounting for primary energy consumption that may in some cases underestimate the contribution of non combustible energy sources. 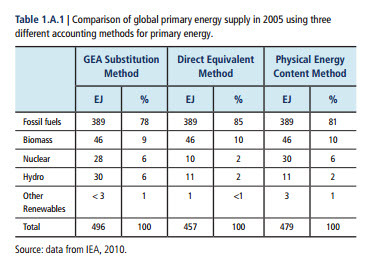 There is an Appendix to Chapter 1 of this GEA report (starts on page 141) that discusses this difficulty. depending on the convention chosen, the contribution of nuclear, hydro and non-biofuel renewables may vary by a factor of three. Note that the figures in the chart above are for 2005, "other renewables" share of the energy mix has grown since then. Rosling's point about the popular miscoception about solar and wind's contribution was that: We think we have done more than we have done and we haven't understood how much we have to do. That point still stands and the massive task that lies ahead in decarbonizing our economy in the face of increasing energy demand suggests strongly to me that we cannot afford to abandon any option, no matter how expensive and unpopular they may be today. All of the low-carbon options are expensive and unpopular. I am sympathetic to the arguments in the recent letter written by Caldeira, Hansen, Emanuel and Wigley. But it is worth noting that they don't mention costs. As for the relative costs of nuclear, biofuels, fossil fuels with CCS, wind and solar, I am suspicious of all claims made by the various lobby groups and I am searching for a balanced analysis. Indeed! As of the end of last year, China has about 258km^2 of domestic collector surface area. Run the numbers and it's a lot of KwE. Fortunately, unlike so many other places (USA, we're looking at you) China's solar hot water industry isn't run like a precious designer boutique. After all, it's just more plumbing, for cripe's sake. Andy, I just pulled figures from Wikipedia. Looks like the solar values came from British Petroleum and the wind power figures from BTM consult. As you noted, numbers can vary widely based on who is doing the analysis and how they look at it... but I don't think there is any equitable way of doing so which still yields total wind & solar contribution of less than 1%. If you are going to look at total energy consumption then solar hot water heating should be included. Even without that your figure from 2010 had the Wind/Solar/Biomass/Geothermal, which is really mostly just Wind, at 0.9%. Global solar electrical generation has more than tripled since then and wind generation is up more than 33%. That said, yes Rosling's point about a lot being left to do is valid... but the 'less than 1%' creates the impression that all this talk about huge growth of wind and solar has amounted to nothing and they will never provide a significant contribution. Instead, we've gone from less than 0.1% of global electricity generation from these sources to over 3% in the past decade. It seems likely that by 2020 we'll be getting at least 20% of our electricity from wind and solar. If, as I expect, solar costs fall below fossil fuel costs for most of the planet (i.e. everything not near the poles) then we'll see a wholesale conversion. Hydro, wind, geothermal, and other options will be cheaper in some areas, but solar works nearly everywhere... once it is cost effective. As to nuclear, I'm not against it per se. It just doesn't seem plausible to me. Renewable power is much larger, growing much faster, becoming cheaper as nuclear gets more expensive, and has a massive edge on perception. The letter you cite argues that we shouldn't ignore any low carbon option. That's reasonable, but may not be true if time and money spent pushing for nuclear could have instead resulted in solar and wind gains greater than would ever be possible from nuclear. The letter authors state, "While it may be theoretically possible to stabilize the climate without nuclear power, in the real world there is no credible path to climate stabilization that does not include a substantial role for nuclear power", but provide no explanation of how they reach that conclusion. To me it looks as if 'in the real world' there is no chance of nuclear power playing a substantial role in climate stabilization. It is too expensive and takes too long to develop. Global nuclear power generation has grown at a snails pace for the last quarter century. At the current rate it would take hundreds of years to replace fossil fuels with nuclear. Even if you cut safety and permitting requirements the high costs would prevent rapid expansion... and the inevitable next disaster would shut the whole thing down. I believe people are overestimating the importance of environmental groups, NGOs etc, on the building of future nuclear power plants. Here in the US, current federal policy is to encourage nuclear power through the Nuclear Power 2010 Program and the Energy Policy Act. I'm not aware of any proposed nuclear power plant being delayed and/or denied permits/licenses because of environmental groups, etc. It's solely ecomonics and that is with large federal loan guarentees that made the Vogtle nuclear power plant complex econmoically viable. The first US nuclear power plant to be licensed in over 30 years. Laying the blame for nuclear energy's demise at the feet of the environmentalist is simply wrong. Here in GA, there is no incentive for solar (one of three states where solar is currently ecomonically viable ) as it would undercut the economics of the Vogtle plant, which got a sweetheart deal in allowing Georgia Power to raise electricy rates before the plant comes on-line. I agree with #16 CBDunkerson that the take away from the article is there is an enomous amount of work and effort still to do with solar and wind so lets get going, and not that solar and wind will never amount to anything so lets do nuclear. Whatever role nuclear will have, will be based on nuclear energy's own merits, and little to do with what various groups think about it. It is costs and an entire country's desires, not some minority groups beliefs. that is going to set a country's energy policy. More Rosling quiz questions here at the BBC. Can you do better than a chimp? Can you do better than an educated Briton? He says: "There is a myth that humans used to live in ecological balance ... they died in ecological balance". I think Malthus addressed that myth some time ago! The point about us having reached "peak child" is not completely good news. As the population becomes more heavily skewed towards the old it means that either the elderly need to work to support themselves, or those of working age will have to work harder to support those who can no longer support themselves. As pension funds are already under strain, this is bad news even for the west. It is a good thing if global population is kept within the bounds that the Earths resources can actually support, but the transition would not be comfortable even in the absence of climate change.